The fully automatic (in line) Series 2400 filling and lidding systems are designed to handle a wide range of stackable (round/rectangular) tubs, generally up to 1 kg/1 litre capacity. Containers up to 150.0mm across may also be accommodated. Available in single, dual or four lane configuration, the system is capable of up to 50 cycles per minute, enabling outputs up to 200 containers per minute on four track machines depending on product type and container size. Available in 2, 3 or 4 lane configurations for filling, sealing and lidding of tubs. Round and rectangular tubs up to max 150.0mm across, 1kg/1L capacity. Up to 200 tubs/min filling and lidding. Up to 140 tubs/min filling with heat seal membranes. 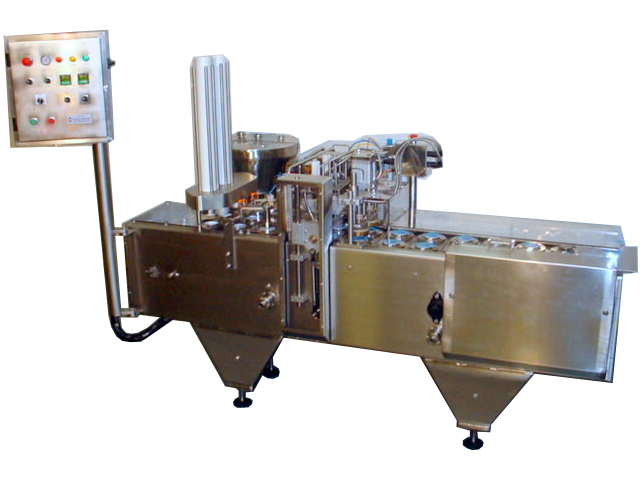 Systems often incorporate multiple head Hunter volumetric fillers. Optional bottom-up fill, container lift at filling stations. Standard no container/no fill and no container/no lid feature. Ejection of tub to optional outfeed conveyor and collating tab.